Learn About Our Parking Lot Line Painting and More! When you need the ultimate in concrete care and parking lot line painting throughout Waco and Temple, TX, call the eSquared Asphalt Maintenance team first. Our seasoned experts are trained in all facets of parking lot painting and other cement marking to ensure that your project is completed accurately and within all guidelines. Our professionals will provide you with fresh parking lot line painting that stands out among the crowd and stands the test of time. Call our representatives at 254-716-8685 to schedule your consultation. 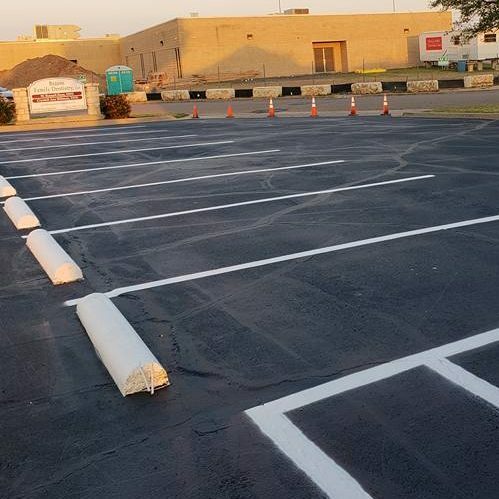 Along with our parking lot painting services, we provide extensive, code compliant marking, repairing, and even cleaning to ensure that your parking lot is always presentable and inviting to your patrons. When you need parking lot services, call our team for professional results that won’t break your budget. Our professionals are also skilled at concrete installation and maintenance at your home. We can provide comprehensive restoration or repair, as well as a complete installation of your driveway, walkway, or other concrete constructs you may desire. We provide cleaning and maintenance services for your concrete, as well as concrete customization. Find out how easy it can be to create a masterpiece on your concrete space with our stamping and specialty decor services. Whether you’re looking for concrete walkway installation or parking lot line painting, in Waco and Temple, TX, no team is more trusted than eSquared Asphalt Maintenance. Call us today at 254-716-8685 to schedule your appointment. Updated on March 21, 2019 at 1:14 pm by eSquared Asphalt Maintenance.